SpongeBob & Patrick: La la la la la. La la la la la. La la la la la. SpongeBob: Hey Squidward, we’re jellyfishing. SpongeBob: Wait! We made a net especially for you! Do you want to come with us? Squidward: Right. But I can’t. Bye bye. Squidward: Oh sure, right! Whatever. (rides his bike) Like that’ll ever happen. SpongeBob: You know, Patrick? It always seems like Squidward never has time for fun. Patrick: Maybe he doesn’t like us. SpongeBob: No, are you kidding? We’re his best friends. SpongeBob: Hey Patrick, Squid’s home! And we’re gonna make sure he’s greeted by his two best friends! Patrick: Oh great! Who are they? SpongeBob: Us! (two shown talking right next to each other as they hang up) Let’s go! (Squidward rolls into his house and turns on the lights to reveal SpongeBob & Patrick with a banner hanging over them with the words 'welcome home' on it) Welcome home, Squidward! SpongeBob: We’re gonna make this your best day ever! (Squidward tries to roll back out but SpongeBob grabs him and turns him around) Well your best day’s sure not gonna be out there. Patrick: Music isn’t best either. SpongeBob: But what is best is what we saved for last. The one sure-fire thing to make your best day ever (the) best day ever! SpongeBob & Patrick: Jellyfishing, jellyfishing, jellyfishing, jellyfishing, jellyfishing, jellyfishing, jellyfishing, jellyfishing, jellyfishing! SpongeBob: This is Jellyfish Fields, where wild jellyfish roam just waiting to be captured. (Squidward tries to get away but SpongeBob stops him again) No, no, Squid! Over here! I know you’re eager, Squid, but you don’t even have your net. Patrick, fix him up while I find him a good specimen. Patrick: Firmly grasp it in your hand. (puts the net handle on Squidward's hand and lets go but it falls to the ground) Firmly grasp it. (puts the net handle on Squidward's hand and lets go but it falls to the ground) Firmly grasp it! (shoves the net into Squidward's hand making a huge hole in the bandages and making Squidward scream in pain) That oughta do it. SpongeBob: (points to a jellyfish) There’s one in position. Ready...set...go! Patrick: I think we better show him how it’s done. Jellyfish: Bz, bz, bz, bz, buz. Da, da, da, da, dum. SpongeBob: You've got 'em now. Patrick: It's in the bag. SpongeBob & Patrick: Oohhh... (Next, we're shown SpongeBob & Patrick, with band-aids on, walking around in front of the easter island head) Hey Patrick. Well, thought yesterday went pretty well, don’t you think? 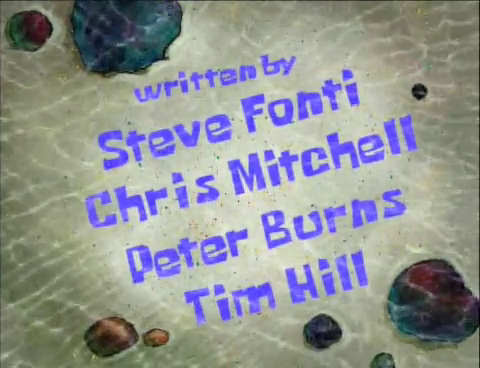 SpongeBob: Oh, great. (laughs nervously. Squidward rolls in on a motorized hospital bed) Hey Squid! How about that... (Squidward ignores SpongeBob and keeps going) ...best day ever? Patrick: You know, from yesterday!